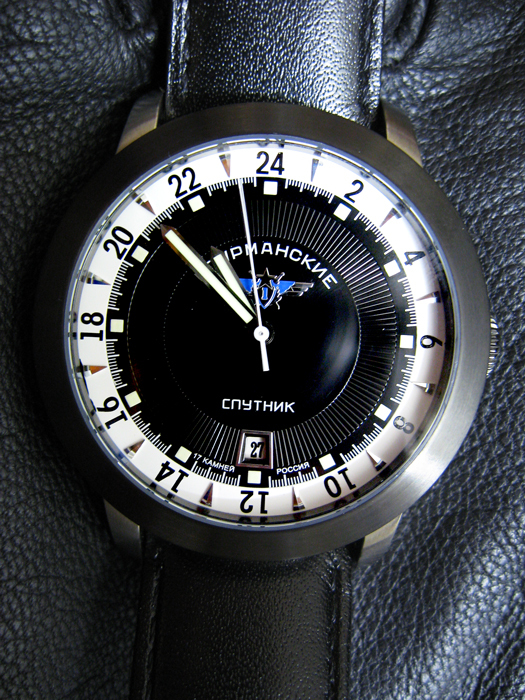 This is one of four currently existing Sturmanskie Sputnik models, this one with a black and white dial. (and a blue Sturmanskie logo). It it somewhat of an exception in the typical Sturmanskie line because in some ways, it looks like something of a cross between a highly functional Aviator and an elegant Sturmanskie. The super luminova hand and dial are the most bright ones I have ever seen, and the dial is easy to read. Still, the watch is also elegant and classical, and this blends of styles results in a watch which can be worn in both formal and casual circumstances, thus making it an ideal daily wear watch.